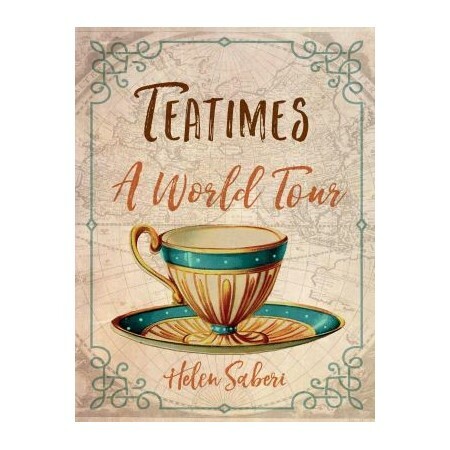 In Teatimes, food historian Helen Saberi takes us on a stimulating journey beyond the fine porcelain, doilies, crumpets, and jam into the fascinating and diverse history of tea drinking. From elegant afternoon teas, hearty high teas, and cricket and tennis teas, to funeral teas, cream teas, and many more, Saberi investigates the whole panoply of teatime rituals and ephemera—including tea gardens, tea dances, tea gowns, and tearooms. We are invited to spend time in the sophisticated salons de thé of Paris and the cozy tearooms of the United States; to enjoy the teatime traditions of Canada, the United Kingdom, Australia, New Zealand, and South Africa, where housewives prided themselves on their “well-filled tins”; to sit in on the tea parties of the Raj and Irani cafes in India; to savor teatimes along the Silk Road, where the samovar and chaikhana reign supreme; and to delight in the tasty dim sum of China and the intricate tradition of cha kaiseki in Japan. Steeped in evocative illustrations and recipes from around the world, Teatimes shows how tea drinking has become a global obsession, from American iced tea and Taiwanese bubble tea to the now-classic English afternoon tea. Pinkies up! Helen Saberi is a London-based food historian and writer. She is the author of a number of books on food, including Noshe Djan: Afghan Food and Cookery (2000), The Road to Vindaloo: Curry Cooks and Curry Books (2008), co-authored with David Burnett, and Tea: A Global History (2010) in Reaktion's Edible series.